No one is perfect only if you think that way. 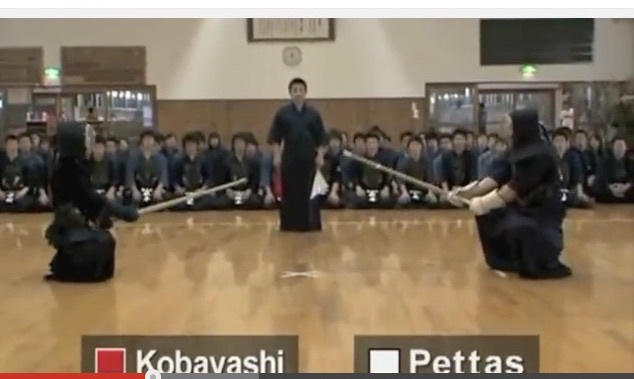 This is an educational TV show for beginning Kendo students as well as high rankers to remind themselves Shoshin (NOT shoeshine). Enjoy! 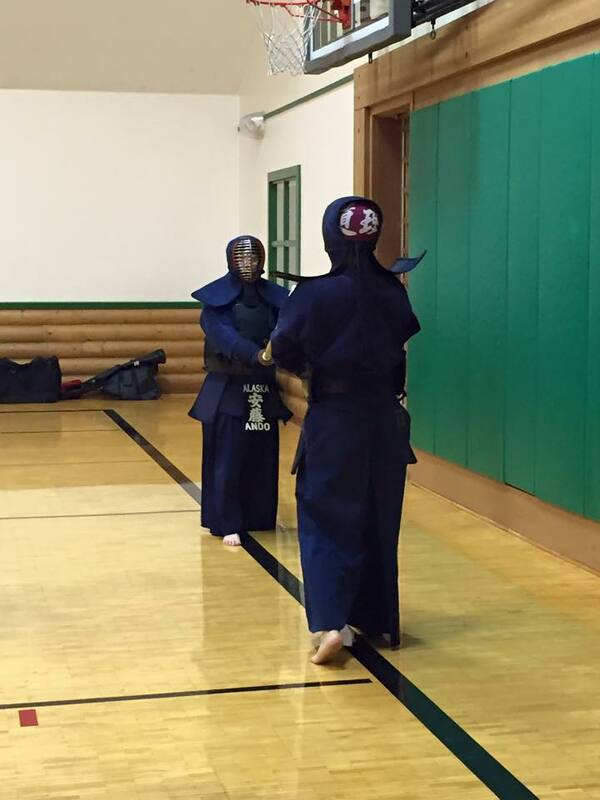 I was invited to share my view of Kendo Shinsa on February 27, 2015 at Bellevue Dojo. 2. Good Product : The Kihon Datotsu, Waza and Hinkaku (dignity) need to be at the level of requesting rank. 3. 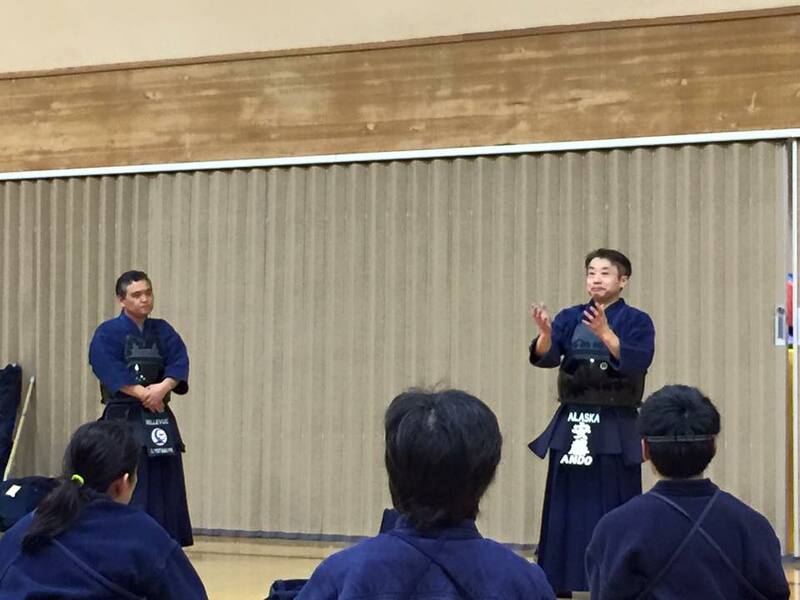 Good Presentation　: How you present your Kendo: Showing correct Maai with Seme, seizing an opportunity and execute a datotsu with Ki/Ken/Tai icchi. 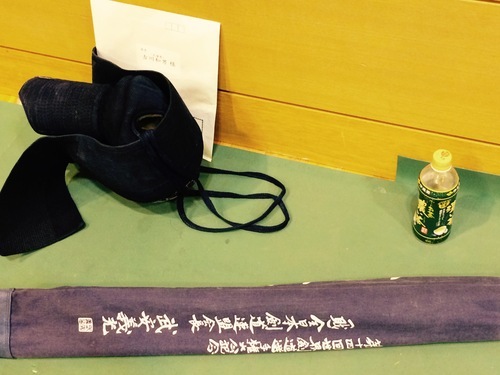 *Going to a shinsa is like going to a job interview: proper preparation tools are inevitable. 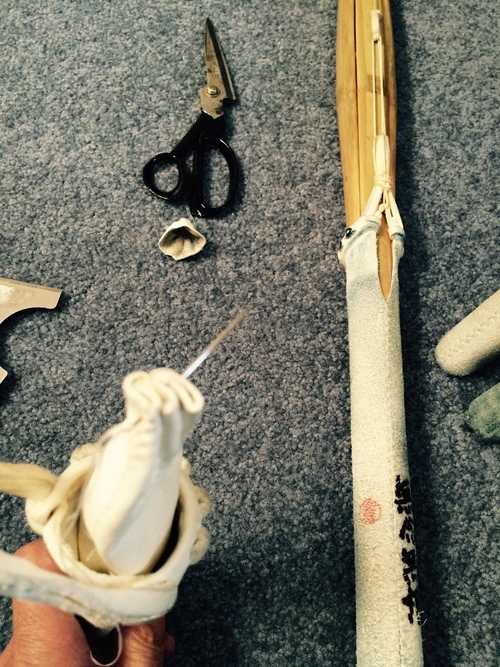 Keikogi & Hakama: sew holes but can not show the patches and stitches , do not use faded color. Hakama should have clear pleats. *a brand new Hakama may need to wash because it sometimes opens like a parachute. Men: Men himo should be around 40 cm from the knot. 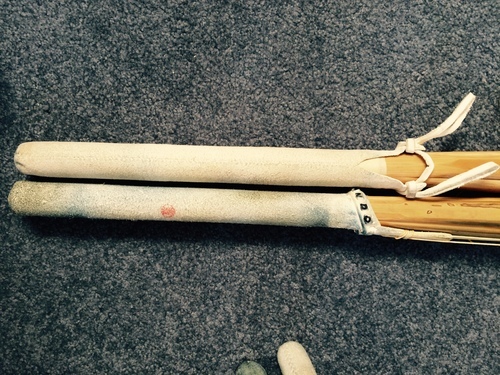 No obvious wear and tear. Kote: Kote himo should not be dangling out. Cut off if happens. Doh: it should look clean. 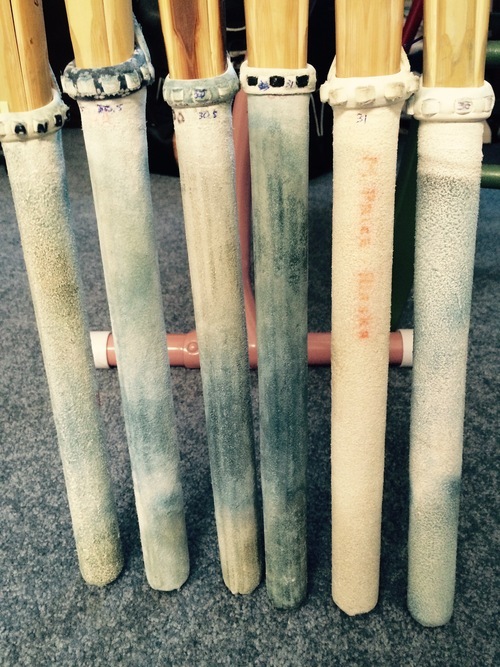 Tare: No obvious wear and tear. Himo should be flat when worn. 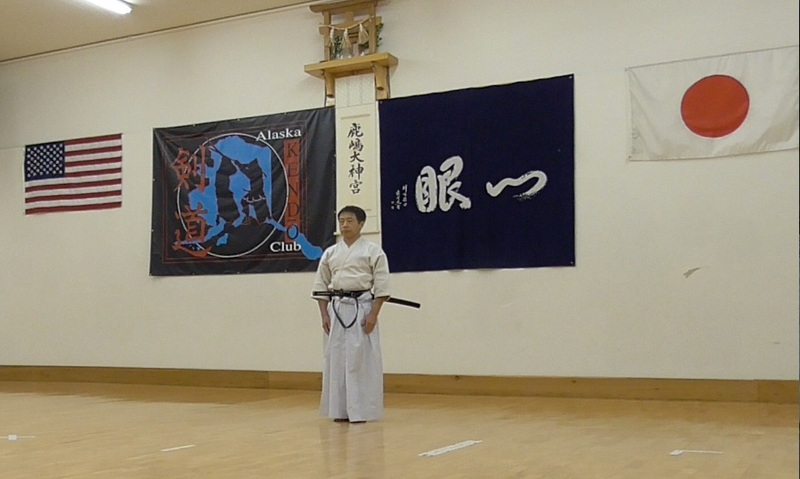 * Correctly wearing Keikogi, Hakama and bogu have direct effect on Kamae, datotsu posture. * Permanent ink felt tip pens can be used to mend the faded edges of Bogu. * Learn how to correctly maintain your bogu. 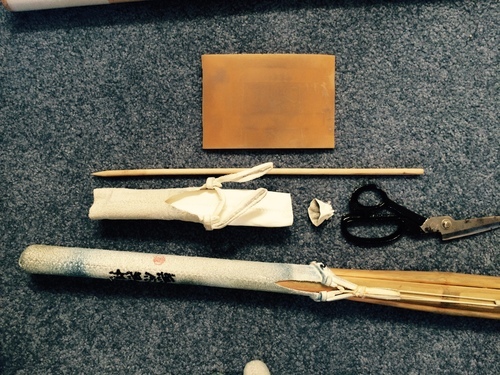 Shinai: The sword is "Bushi no Tamashii (Spirit of Samurai)” Check Tsukagawa and Tsuru tightness (can not be too loose), No damage on the staves. Tenugui: make sure that a part of Tenugui is not flapping out of Men. *Learn correct Bowing: Rei, Sage toh, Tai toh and the right hand position. *The 3 steps to the starting line with dignified look. Proceed quietly, but with focus (Kihaku). *if able to enter the shisa place before the shinsa, check the positioning if possible (stand at the starting line and check the lightings on both side. *Practice Reiho daily, Kata practice is also very helpful for this. 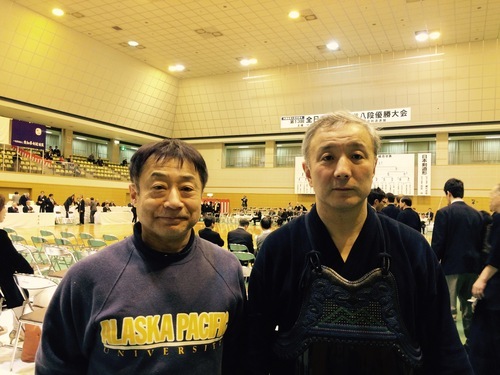 *Stand up from Sonkyo and show the Kamae to the judges for a few seconds. *Then step in and show the Kiai to the judges. *Then show the strong seme and your way to approach the opponent. 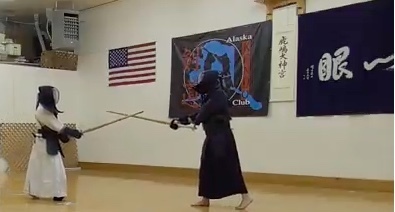 This is the part that one can show one’s Kendo style. *One’s profound understanding on Riai (Theory) should be shown here. The best opportunity to show your Kendo. 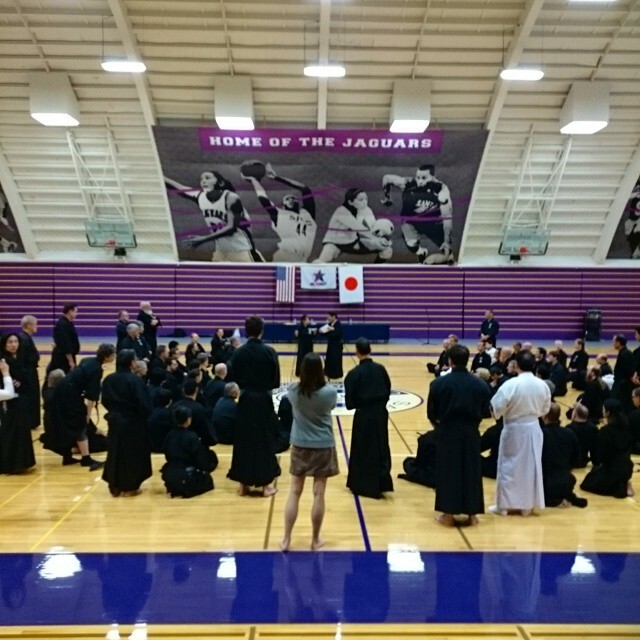 *At daily practice, try to improve good part of ones Kendo and try to fix the weakness carefully. *The shinsa should conclude by showing your strike(s) with Ki/Ken/Tai Icchi. *The 2 biggest difference in the mind set between a shinsa and a shiai are: 1: Kuzure nai (No Kuzure = not to deform, crumble or corrupt) and Nigenai (No Nige = not to escape). 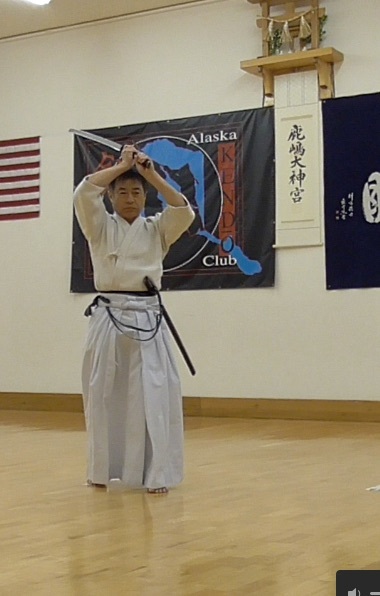 Slightly deforming one’s Kamae, seme, swing-ups to make the opponent off balance is commonly seen in a shiai. 3 point guard position is not a hansoku in a shiai. One can easily execute Kote and especially Doh strikes with twisted body and considered as an ippon (yukodatotsu). This may be one of the reasons that some senseis tell us not to hit doh at shinsa. 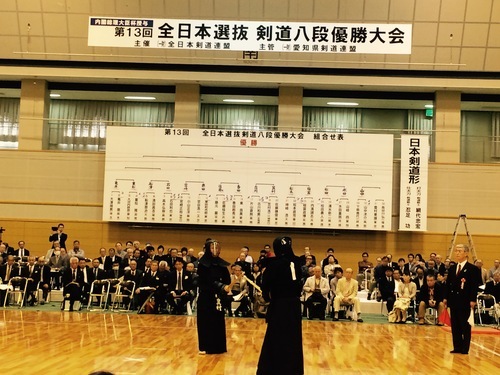 Kuzure in Seme : such as one proceeding with shinai up, blade side up, tip pointing at opponent, etc. Kuzure in Datotsu: Kote and Doh can be easily executed with crumbled form. 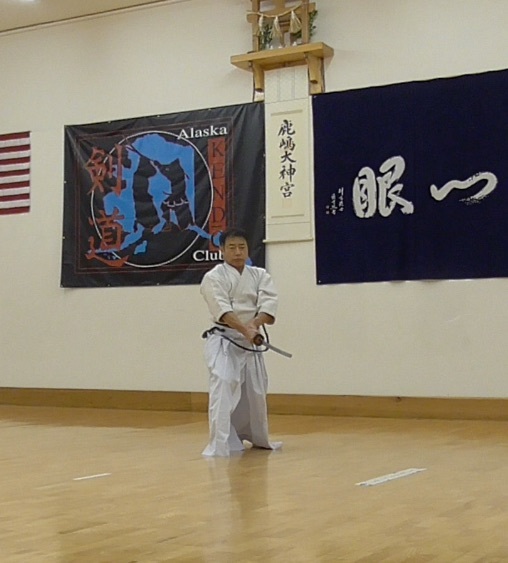 Kuzure in Kamae: Tilting head side ways, twisting body, assuming 3 point defense position, etc. Kuzure in Zanshin: hitting the floor after a strike (sometimes seen in Shiai). Nige: to escape from opponent’s Seme is considered a waste of time. Try to seme back. 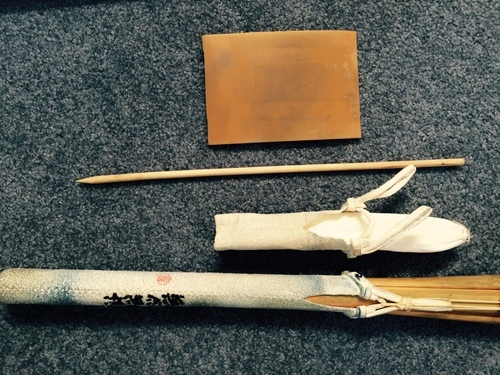 1: Know Your Maai: measure your maai by stepping back from the point that you put your monouchi of the shinai at opponent’s Men, and take a big step back. That is your “Personal Uchima." 2: Try to figure out how to approach the opponent to get to your Uchima. B. When opponent is moving backward to escape: Hiku Tokoro. *This may not happen much at a shinsa. *Being able to make a smooth operation, you must always have Sen (= Body, mind and sword are all in control to attack). A,B,C are easy to figure out, but D requires much experience in training to see if the opponent is actually frozen or not. It may appear to be an opening, but it could be a trap. The opponent may appear to be frozen, but may be a fake one. It is called Kyo and Jitsu = Opening and Trap. Kyo can change to Jitsu and vice versa. 1: With higher rank: Because your seme may not be strong enough to freeze your senpai, this is usually a trap. 2: With the same rank: It’s 50/50 chance. 2: With the lower rank: you are in control most of the time and therefore it must be an opening. *This ability of sensing Kyo and Jitsu separates your level to the higher one. *To learn how to change Jitsu to Kyo will take your level even higher. I wish everyone a good luck at shinsa! *Have a clear image on what you want to do in shinsa. Review the visual image from the start to the end. That way, after the shinsa, you can compare with what actually went on and figure out what you need to work on for the next shinsa. 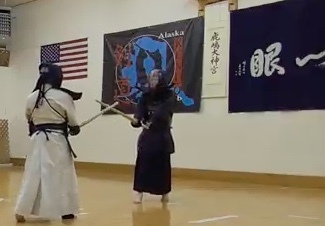 Remember “ Not passing the requesting rank” is not a loss, but that is a gain for your Kendo in a long run. Because you are now serious in reviewing your shinsa Keiko and comparing with the image you had before the shinsa. Those who passed may not do that and which could be a big loss. *To try to improve a keen sense to see the truth: think of others. *To have an open mind (pure heart, honest and sincere attitude) to listen to others: hints and answers are there to be sensed. *To greet from the heart, Rei with respect, show appreciation. *To have time to pick up a trash when found and toss it to the nearest trash bin. 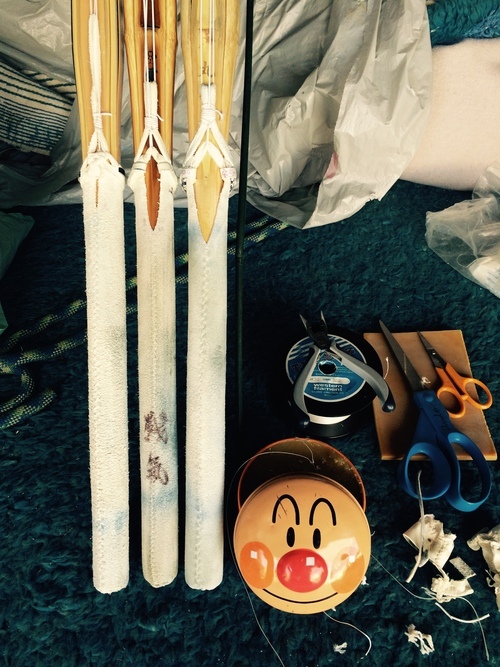 Believe that these will make my Kendo better and stronger. Greetings: Our fellow kenshi Alex Bennett Sensei was on NHK TV show that shows my Alma-matter, Kansai University (Kandai). 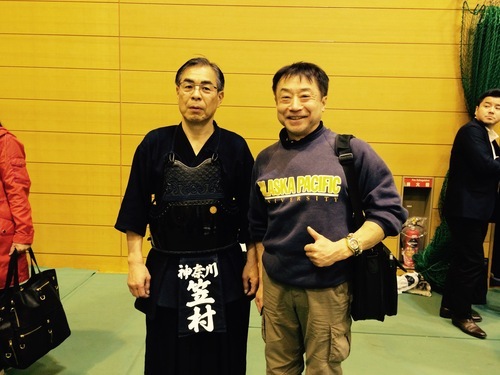 He now teaches Bushido and Budo as well as Kendo to his Japanese College Students at Kandai. Someone who makes a mistake sometimes uses excuse "no one's perfect." In reality, perfection may not exist. But in theory, it does. For example, if there is no perfect image, nothing can be done. An architectural draft must be perfect to build a house even though the house built based on that draft may not be perfect. This concept can be applied to Kendo. 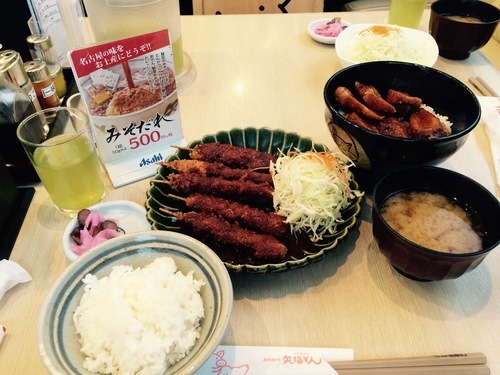 Because you have the vision of the perfect Menuchi, you can try to execute that. And you believe that someday, you will do it as you imagine it. In reality, it may not be possible, but in theory, it is possible. Therefore it will be possible. No one is perfect, but that can not be used as an excuse. It becomes the truth if you give up trying to be perfect. No one will become perfect. No one will get even close to it. Having the perfect image and try to get there will only get you to near perfection. Important part is not "to become perfect", but it is "to have the perfect image" and "try hard to get up there". I believe that the concept of Zanshin includes this idea.